With two different styles available, the two different versions of the Pull-Out Base Organizer are sure to create a unique storage option for your kitchen. Both styles include the technologically advanced pantent pending "tri-slides" that minimizes any side-to-side motion and provide complete stability when pulled out of the cabinet. Along with the patented door mount brackets that allow up to 5 inches of flexibility for trouble-free installation on any door style. 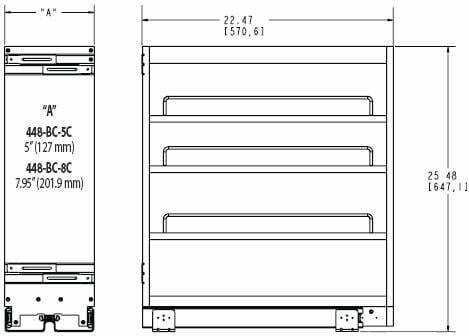 The 444 Series is designed for full-height base 12" Kitchen Cabinets. The beautiful wood pull-outs with chrome accents features a stainless steel panel and an array of accessory hooks for ideal customization for your storage needs.